A quarter-century ago when Wonder Spouse and I were younger and over-enthusiastic about the growing potential of our recently acquired five acres of Piedmont goodness, he picked up a handful of soil and declared, “This land will grow potatoes!” My potato-loving man of Irish heritage had long dreamed of such an endeavor, and if you’ve ever eaten a freshly harvested potato, you know why. The French word for potato is pomme de terre, which translates to apple of the earth. This made no sense to me until I cut into a freshly harvested potato the first time. Just like a ripe, fresh-picked apple, the potato was crisp, snapping open as I cut it, with the same sound an apple makes when I slice into one. And in a white-fleshed potato, the flesh glistens just like the flesh of a fresh-cut ripe apple. The French knew what they were talking about! The first year we grew potatoes, Wonder Spouse planted seven different kinds. We devoted several beds to nothing but potatoes — whites, yellows, blues, purples. Some were fingerlings, others best for mashing, some for roasting. Wonder Spouse was in Potato Nirvana. Our unfinished, cement-floored basement turned out to be ideal for potato storage. We ate our own harvest well into the late fall that year. Wonder Spouse’s most memorable potato culinary triumph was a 4th of July potato salad using red, white, and blue potatoes. It was patriotically delicious! By the third year of potato production, the voles had found our garden. That year, we barely harvested any whole potatoes. The voles liked to gnaw about half of one, then move on to the next. Wonder Spouse gave up on growing his own for about a decade, consoled by the fact that now our local farmers’ markets were brimming with locally grown organic potatoes, even many of the same kinds he had grown himself. Then he spotted potato bags in a gardening catalog, and hopes for his own potato harvest brought back his potato-loving enthusiasm. I told you about his first trial with three potato bags here, and his results are here. The voles cannot penetrate the bags, and the potatoes grow unmolested. He grows a different variety in each bag, and his harvest last year was better than his first harvest the year before. Each year, he tweaks what he uses in the growing medium, how he settles the bags in the garden, and so on. 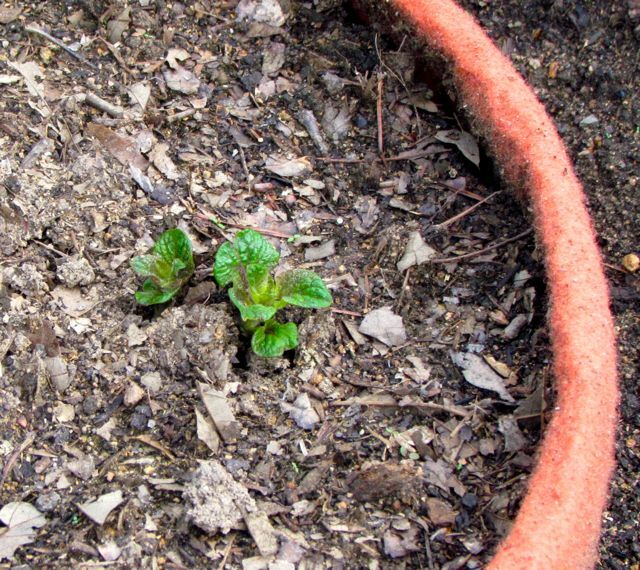 This year, he is growing a continuing favorite, Purple Viking, a new fingerling variety (for him) called Kipfel, and an early potato that intrigued him called Dazoc. All are looking good so far. 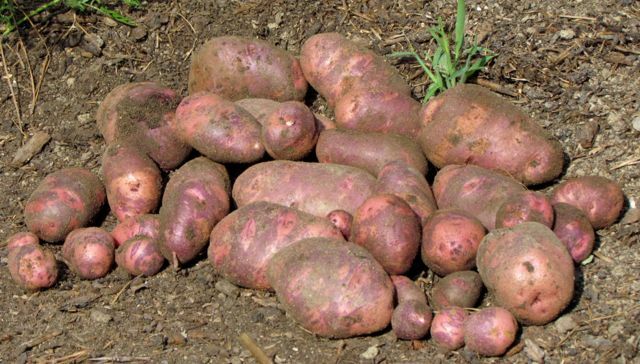 Purple Vikings store well, are drought-resistant, and yield consistently large tubers. They make the best-tasting mashed potatoes you will ever eat in your life. It has snow-white flesh, and its skin is purple splotched with pink-red. In our area, freshly harvested Purple Vikings are usually available in our local farmers’ markets in June. Kipfel fingerlings intrigued Wonder Spouse, because they are purported to be one of the most productive fingerling varieties, and for Wonder Spouse, abundant fresh potatoes are always a good thing. It is also supposed to be more heat-tolerant — a bonus, since our Piedmont summers tend to heat up by May. I think Wonder Spouse settled on Dazoc as his third variety this year, because these dark-red-skinned potatoes are purported to make great hash browns — one of his favorites (and mine, when he makes them). This variety was developed in the early 1950s in Nebraska and maintained by local growers even after commercial growers moved on to other varieties. 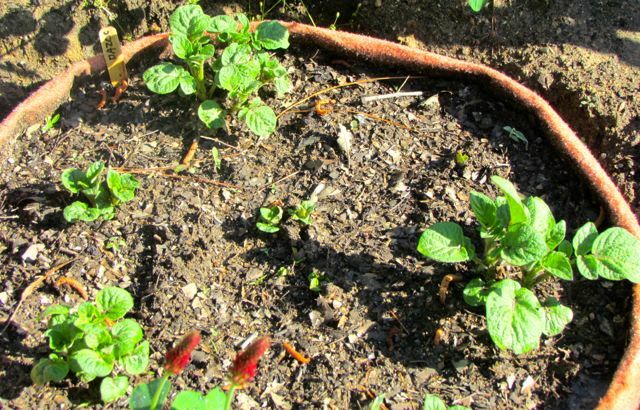 This year, Wonder Spouse plunked his potato bags in an area of the garden full of blooming crimson clover. The clover has grown tall, but I’m trying to nudge it from around the bags without removing it entirely. 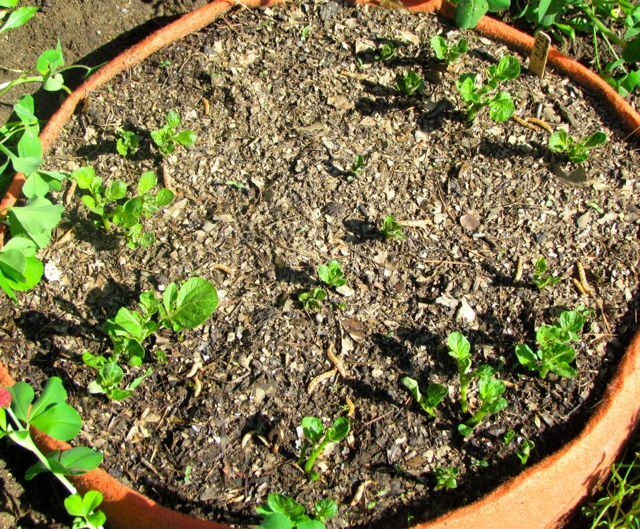 My neighbor’s honeybees work the clover from dawn to dusk, and I really don’t want to deprive them of this resource, especially since soon the potato plants will be taller than the clover. And the more bees visiting my garden, the more tomatoes, peppers, squash, beans, etc. I will have to harvest and share. 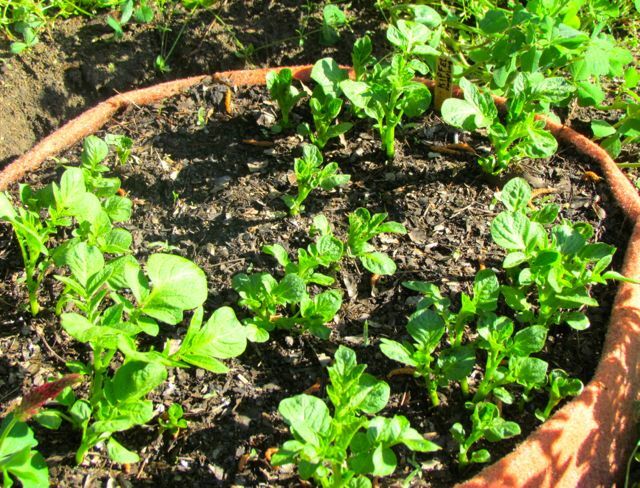 It’s a win-win for the garden — and Potato Nirvana for Wonder Spouse. In another month or two, we’ll have Purple Vikings to enjoy. This was last year’s harvest in early July. I am not a gambler by nature — except for gardening, of course. Anyone who tells you gardening is a science is kidding you, or themselves perhaps. Science can help a gardener, to be sure. 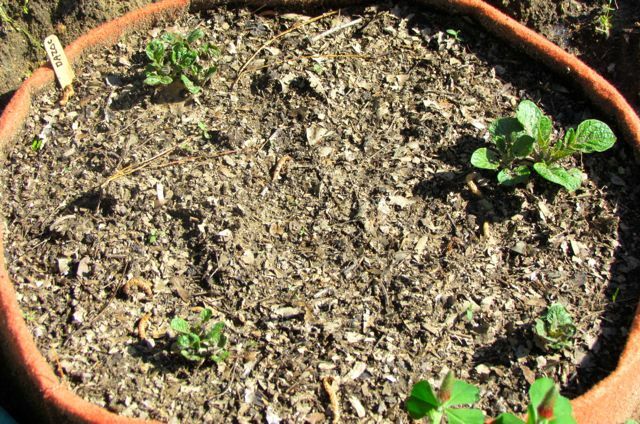 Understanding the environmental microclimates on your property, the species that naturally occur on it, and the geology of your land will absolutely contribute to your gardening successes. But wild cards abound — weather fluctuations, animal predation, neighborhood vandalism. Stuff happens; gardens suffer. Sometimes. As a gardener for over five decades now, I weigh all the variables as best I can, then I go with my gut. Experience should count for something more than wrinkles, right? It should help me make the right gardening calls when my options are not absolutely obvious. Thus is the dilemma of spring vegetable gardening in my region of North Carolina. Some years, spring has come so reliably early and warm that I’ve planted out tomato plants in early April. Then there are years like this one. For most of last week, weather forecasters were calling for snow for my region today. Measurable snow is not unheard of around here this time of year, but it is unusual — and entirely unwelcome. As last weekend approached, the weather seers began to vacillate. Perhaps the snow would miss my area and pound the northeastern US instead. Perhaps. But is perhaps enough to gamble my spring vegetable garden on? Surveying the size of the greens thriving in my greenhouse, and knowing that I wouldn’t be able to plant them out for at least another week if I waited, I decided to gamble. Greens basking in Saturday sunshine before being transplanted. On Friday, I planted the onion plants that had been patiently waiting for me since Monday when they arrived in the mail. Onion plants are remarkably forgiving. Even though they look a bit shriveled and worse for wear when you make them wait, experience has taught me that they’ll plump up in no time, sending up green shoots, putting out fresh roots, and fattening sweet bulbs for later harvest. They don’t look like much now, but give them a few weeks. 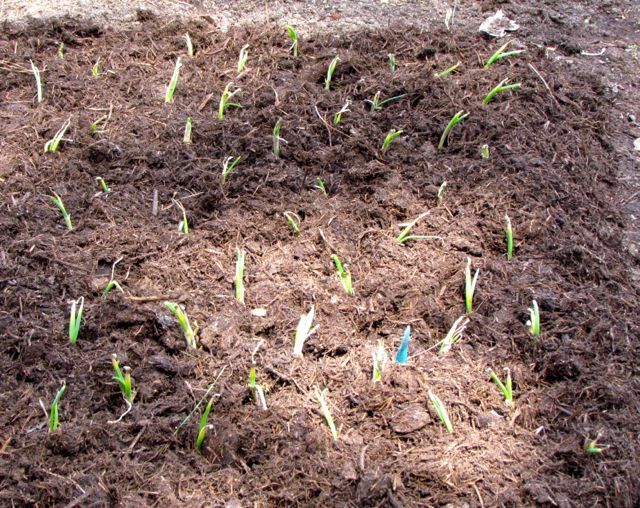 I mulched the newly planted onions with mushroom compost from my favorite local supplier. This material is used by local mushroom growers once, then recycled into compost after harvest. It makes my local earthworms deliriously happy, and it protects the onions from heavy rains. I planted onions at either end of one of the long beds. In between, I’ll sow seeds of beets and carrots as soon as this latest round of wintry weather passes and the following warm rains end. On Saturday, Wonder Spouse focused on his beloved potatoes, while I tucked in all the greens I described in my previous post. As I mentioned in that post, I did acquire a flat of broccoli seedlings to plant with the greens. They’re in the back on the left in the top photo. Viking Red — Bright red skin, holds well in storage. Full-bodied flavor for baking and boiling that is extraordinary. Grows great in Texas and hot climates as it has ability to withstand heat. Rapid sizing, can grow from golf ball to baseball size overnight. Purple Viking — Has all the characteristics of its parent Viking Red, but it has a true purple skin with pink-red splashes. Perhaps its most remarkable attribute is its waxy snow-white flesh. Drought-resistant and a yielder of large tubers. Its unique taste is loved by many and will get sweeter with time. Marris Piper — This favorite from the British Isles never disappoints! Producing high yields of large, cream-skinned, cream-fleshed oblong tubers, Marris Piper makes awesome French fries and mashed potatoes that are out of this world. It’s very similar in taste and texture to the Kerr’s Pink and Yukon Gold potatoes with higher yields. 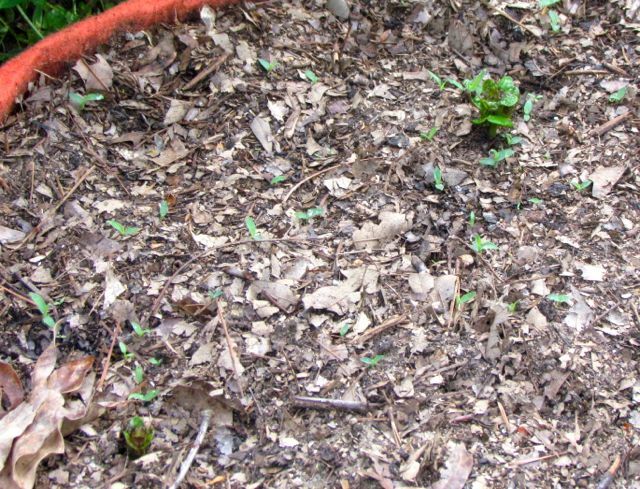 He’ll use the pile of shredded leaves and compost to fill in the bags as the potato plants grow. 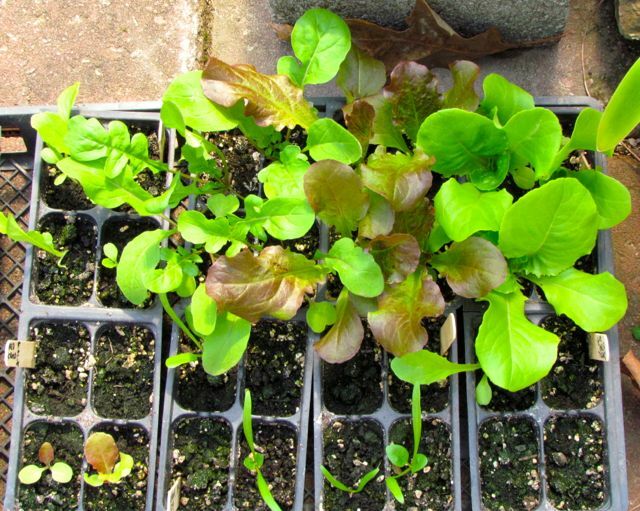 At the back of this photo, you can see my bed full of newly transplanted greens. Here’s what the bed looked like before I started. 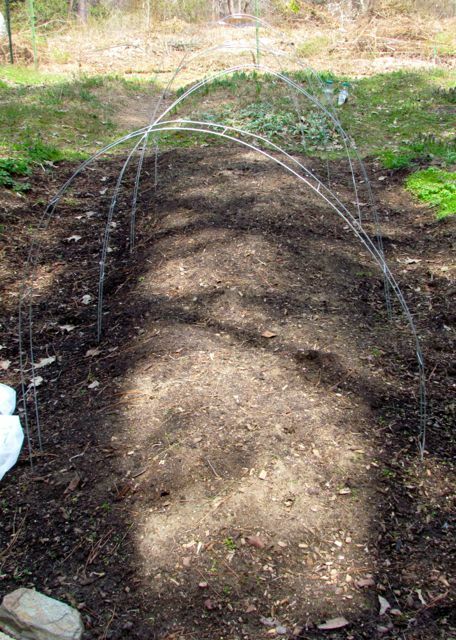 The metal hoops will support a garden fabric tent that I hope will protect the greens. 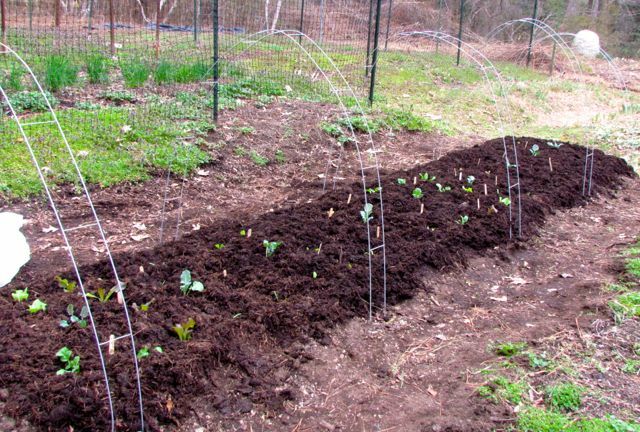 Broccoli plants are in the center of the bed where the hoops attain maximum height. Wonder Spouse is tucking in the final bits into the bed, using metal stakes designed for this purpose. Although the snow now heading for the northeastern US missed us, the cold will visit for about 48 hours. Lows are forecast to be in the mid-twenties, which at my house usually means low twenties. But one night will be windy, which is actually a good thing, as long as the hoop fabric holds. The next night, however, will be flat-out colder than normal for this time of year. Will my transplants survive? See my first paragraph above. Sometimes, a gardener just has to go for it. I carefully weighed the pros and cons. Experience has taught me that spring temperatures don’t last long in my area. Spring greens are only happy when the air is cool. Thus, I made the call to not wait another week to get them in the ground. I’ve done all I could. 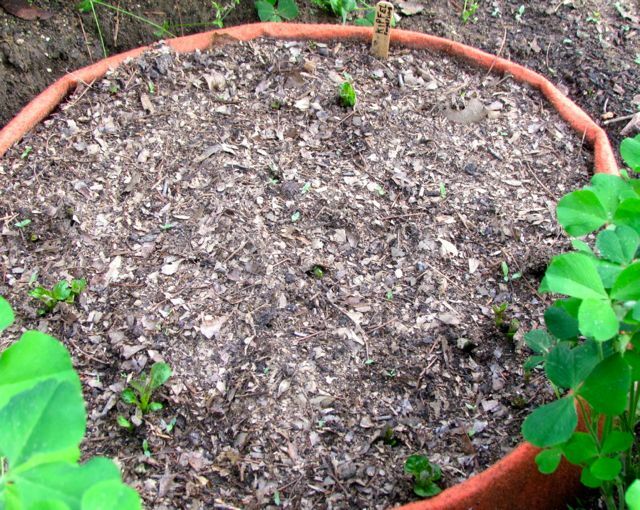 They’re well mulched and watered, and they are covered securely by their fabric shelter. They are also still small, which makes them a bit more resilient, at least, that’s usually the case. I’ve got about three nervous days in front of me before the weather warms and turns rainy for the weekend. Will my garden gamble pay off? Stay tuned, my gardening friends. Whichever way it turns out, I’ll be sure to share the outcome. I confess I am hopeful. After all, we’ve already dodged the accumulating snow once forecast for my region today. 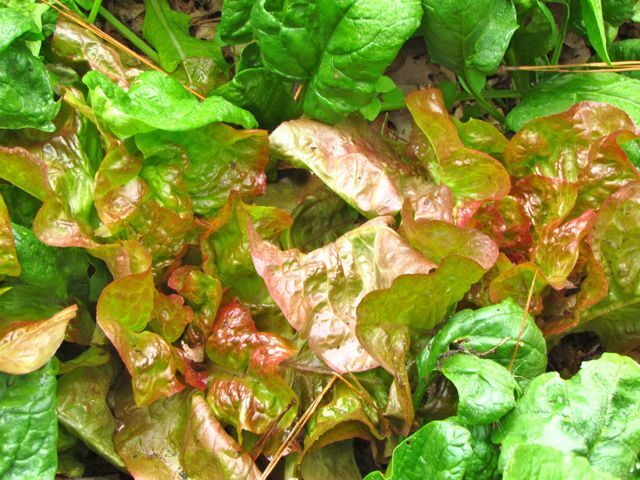 Here’s hoping fresh-picked spring salads are just a few weeks away! We will confine our bag use to potatoes. One of my other nicknames for Wonder Spouse — assigned with great affection — is Mr. Potato Head. My spouse would eat potatoes once a day and twice on Sundays if he could. It’s not that he dislikes other vegetables — he loves most of them. But he waxes poetic on the versatility of what some deem a humble spud. The secret is not to eat the mass-produced varieties sold in ten-pound bags at your local chain grocery store. My Mr. Potato Head has become quite a connoisseur of this often unappreciated tuber. Varieties abound, if you know where to look. Yes, as with tomatoes and peppers, you can find entire catalogs devoted to selling potato varieties like Colorado Rose, Conestoga, Dakota Pearl, German Butterball, Purple Peruvian, and Yukon Gold to name a very few. Some varieties are best for mashing, others for frying, still others make ideal baked potatoes. Fingerling potatoes are gnarly little tubers that resemble arthritic fingers and come in colors ranging from pink to pale yellow. Fingerlings are beloved by gourmet chefs and taste buttery without the addition of actual butter. If you grow your own, you can have red, white, and blue potatoes for your July 4 potato salad. Mr. Potato Head has produced this patriotic dish more than once. And if you’ve never eaten a truly fresh potato, you have no idea what you’re missing. When you cut into a fresh potato, it’s like slicing an apple — crisp resistant flesh yields moistly to the knife. As soon as we realized that our five acres of Piedmont possessed sandy loam soils (a rarity), we knew we would be growing root vegetables, and they’ve done well here during our over 20 years of vegetable gardening. Carrots grow long, straight, and sweet. Beets plump up roundly. And potatoes multiply and flourish. At least, they did until the voles decided we were growing the potatoes for them. The down side of fencing out the deer, it turns out, is that neighborhood cats and other predators can’t get inside to catch burrowing rodents. The rodents, alas, have figured this out, and now clearly consider our vegetable garden to be their own personal Eden. Still, I manage to get excellent yields from all veggies except the potatoes. A few years back, we lost more than half our crop to the voles. Every other potato we pulled was thoroughly chewed. Because we are fortunate to live in a region populated by numerous small organic farms who sell their wares at local farmers’ markets, Mr. Potato Head has been able to find most of the varieties we once grew, freshly dug and as tasty as what we grew ourselves. However, some speciality varieties are not productive enough for the small farmers to grow them, so Mr. Potato Head has been pondering ways he can grow those himself. Some folks grow potatoes in tires, but we nixed this for two reasons. First, tires are not organic. 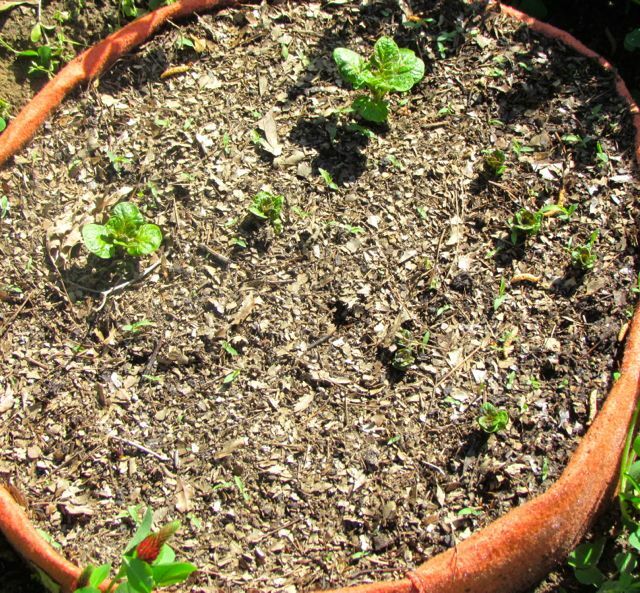 Heaven knows what chemical leak into surrounding soils from tires exposed to hot sun and regular watering. They also are connected to the ground, meaning industrious voles would still find their way to Potato Heaven. Barrels and other solid enclosures seemed likely to present drainage issues, and the expense of those options was prohibitive. Then Mr. Potato Head spotted the item in the top photo in one of the many gardening catalogs that fill our mailbox. These bags appear to be made out of a nontoxic landscape fabric that permits air and water circulation, but is too strong to be penetrated by voles. We were intrigued, but the cost seemed high, so we passed on this option. But last fall, Mr. Potato Head spotted these bags on sale in the catalog. So we bought three bags. I think we settled on the red ones because of research showing that red-colored mulch improves productivity of tomato plants. Mr. Potato Head is betting that since potatoes and tomatoes are in the same plant family, red bags should boost productivity. Time will tell. Limiting himself to only three varieties was his greatest challenge. We once grew seven or eight kinds every year. After much pondering, Wonder Spouse settled on Bisons, Purple Vikings, and Kipfel Fingerlings. I believe he has trouble finding at least one of these varieties in the local farmers’ markets, so he was eager to have them once more. We will fill the bags with a mix of our soil, a bit of compost, and a lot of broken-down leaves. 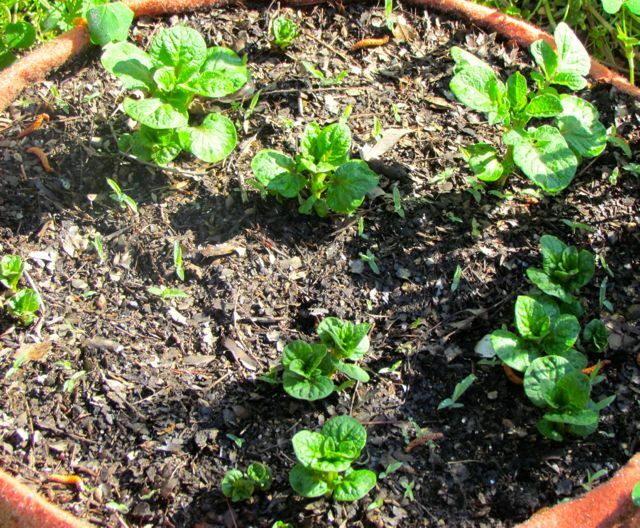 As is always true of potato planting, you plant the tuber pieces in a deep hole and cover them with an inch or so of soil. 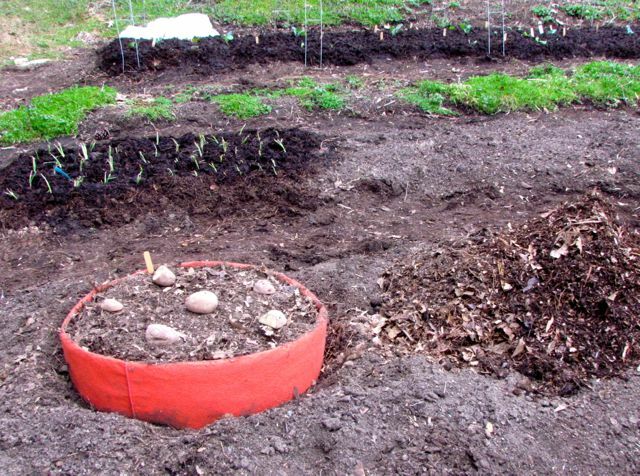 As the plants sprout and grow, you add more soil, so that the stems will produce multiple levels of tubers. We’ll find a spot in the garden for our red bags of potential spudly goodness. I’ll provide updates as they progress through the season. If this works, Wonder Spouse may try his hand at constructing his own bags from landscape fabric we have collecting dust in our garage. 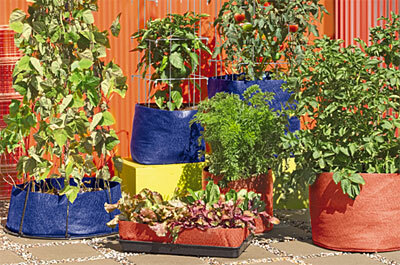 If all goes well, perhaps future gardens will contain bags full of all of his favorite varieties. I’ve always said, if you’re going to go the trouble of growing your own food, you should absolutely grow the food you like, and at my house, that most certainly includes breakfast hash browns and July 4th patriotic potato salad. Next post, I’ll update you on the other varieties I’m growing this year. I’ve mostly stuck with old reliable favorites, but as always, a few new varieties looked too tempting to ignore. Have you ordered your seeds yet? If not, get busy. Here in the southeastern Piedmont, spring garden preparations should begin in just a few weeks. Spring green options always tempt me to excess production, but they’re good for me, right?